WEDNESDAY, OCTOBER 31, numberofU.S.troops are ad vising forces opposed tothe coordinating resupplyandhelpingdirectU.S. airstrikes Taliban targets. Rumsfeld didnotsay whichU.S.troops areinAfghanistan orhowlongtheyhavebeenthere,butfrom his description oftheirmissions it seemed likelytheyinclude Army Spe cial Forces, commonly called Green Berets. He said fewerthan100 areinAfghanistan.AROUNDTHEWORLDTHURSDAY'SLOCALWEATHERHIGH80LOW64 u.S.troopsconfirmed in northernAfghanistanWASHINGTON(AP)-The Pentagon confirmedthepres ence of American troopsinnorthernAfghanistan forthefirst time Tuesdayandcreditedthemwith improvingtheeffec tiveness ofU.S.bombing raids. Defense Secretary DonaldH.Rumsfeld told a Pentagon news conference a "very modest"ACROSSTHESTATELegislature approvestwospecialtyplatesTALLAHASSEE(AP)The Legislature passed a bill to cre ate "United We Stand'!and"American Red Cross" specialty license platesTuesdaywithmoneyraised fromtheautotags going to effortstofight ter rorismandbiological attacks. Senate Majority Leader Jim King paradedupanddownthechamber's aisle withanen larged version ofthe"United We Stand" plate as opponents argued against passingthebill(SB94B).The plate depictedtheAmerican flag overanimage of Florida. The House later passedthemeasure 110-4, sending it toGov.Jeb Bush. Organizations usually have togather40,000 petition signa tures for lawmakerstoconsider specialty plates.Thebill waivedthatprovi sion,whichSen. Skip Camp bell, D-Fort Lauderdale, saidcouldleadtoscoresofnonprofitgroupsseekingthesameexemption. Campbell said it sets abadprecedentin waivingthepetitionrequirement.INGAINESVILLEBioterrorismseminartobe heldatShandsUFVicePresidentofHealthAffairs Ken Berns is sponsoringabioterrorismseminartodaytoaddressseveralhealth-relatedtopiCS.UFexperts on smallpoxandthetherapyofinfectious dis eases willspeakontheirrespectivespecialtiesandanswerquestions.UFhasparticularinterestinthebioterrorismissuebecause"facultyinCollegeofMedicineareonseveralnationalcommitteesconcerningbioterrorism," Berns saidinane-mail interview. Theseminarwillbeheldat5p.m.intheUFHealthCenterMedical Sciences Building Au ditorium, Room 2-200.Itisnotopentothe'public,butShands employees, as well as faculty,staffandstudentsfromthesixhealthsciencecenterschools -includingtheCollegeofPharmacy,theCol legeofDentistry,theCollegeofHealthProfessions,theCol legeofMedicine,theCollegeofVeterinary MedicineandtheCollegeofNursing are welcometoattend..ONLINE TODAYlocalBands:SignupfortheAlligatofsnewlocalmusicsiteatwww.olligotor.org/mp3 www..,JJligator.org 3:30p.m. -Booat theZoowillbeheldattheSFCCTeachingZoountil7:30p.m.6p.m. -TheBlackStudentUnionwillhost a HauntedHouseuntil9p.m.behind the InstituteofBlackCultureand the InstituteofHispanic-LatinoCultures.8:45p.m. -"z"Andrushysun,theTampaareaFellowshipofChristianAthletes director and formerNFLplayerwillspeak atFCA,whichwillbeheldinTouchdownTerrace.10p.m. -VISA,HSAandASUwillhost afreeHalloweenpartyforUFstudentsuntil2a.m. atMartiny's,238WUniversityAve.The"Ghosts,Hauntings & Poltergeists"lecture held TuesdaynightatSFCCisaclossofferedbyCommunityEducationatSFCCandcosts$30.The UF footballteom's (lome atSouthCarolinaonNov.10willbetelevisedbyESPN.Kickoffis7:45p.rn.WereportedotherwiseinMonday'sAlligator.Weregrettheerror.TheAlligatorstrivestobeaccurateandclearinitsnewsreportsandeditorials.Ifyoufindonerror,pleasecalltheeditorat376-4458orsendane-mailtoeditor@alligator.org.volume 95ISSN 0889-2423number 50theindependentfloridaNotofficiallyassociatadwiththe ot g@h"!y!!! :.unicalions Inc.,ofGainesv'"e,Fla.Newsroom 376-4458 Fax: 376-4467 Editor TreyCsarManaging Editor / Print Teresa Wood Managing EditorINew MediaJenniferFalor Online Staff Andrew Diec, Sheila Fridman, Michael Lee, Editorial Page Editor Jason Brown Stephenlink,Brandon McCoy News Editors Andrew Marra, Kristen Moczynski Editorial Board Members Michele Jones, Mark Ward Sports Editor Seth Traub Tallahassee Bureau Chief Joe Black Special Projects Editor Jenny L. Allen Assistant Sports EditorJeffDarlington News Copy Desk Chiefs Sharon Bisnow, Heather Leslie Kickoff Designer ,.,,JenniferHaines Photography Editor Danielle Rappaport Sports Copy Desk Chief Tracy Swartz Detours Editor James Montgomery Assistant PhotographyEditorAngela Brooks Staff J.P. DeGance, Sarah Myrick, Bart O'Connell Detours As'sistantEditorTracy Swartz Copy Editors Robyn Benkendorf, Jamie Braun, Denise Emerson, Detours Designer....................................Blythe Zava....Emily Engel, Alissa Fischetti, Julie Halladay, Katherine McFarland Photo Staff Daniela Aguilera, Doug Finger,......................Blenda Perez, Kalia Robinson, Melissa Stamm Julie Petrick, Roberto Westbrook Research Librarian Anne Vickey Art Director R.J. Reed Ombudsman Tiffany SmithABOVESALTYDOGSALOONCOSTUMECONTEST$1.00Bottles, Wells & DraftsLiveMusic with MichaelJ.ALLNEWLadies' NightLadiesdrinkFREEallnight!$2 Pitchers+$2LongIslands+$1.00BottlesDJMutley.AlligatorOnline.EmalllettersOallJgator.orgWebhttp://www.alligator.orgDisplayAdvertisingVoice: (352) 376-4482 Fax: (352) 376-4556AdvertisingDirectorBrad Smith bsmith 0 alligator.orgAdvertisingCoordinatorLisaAklyAdvertisingOfficeAssistantsMichelleDetweiler,SussyVasquezClassifiedAdvertisingVoice: (352) 373-RND Fax: (352) 376-4556ClassifiedAdvertisingManagerEllenLightellight 0 alligator.orgClassifiedClerksErinAlvarez,JuliaFarkas,ElissaTaft,..........................KristenChambers,LeahZissimopulosJudgesneeded for all events:Individual Events(IE) Student Congres Lincoln Douglas Debate Team DebateHired judfJes neededforthe Florida BlueKey Hi9h School Debate Tournament. Friday, November 9th Sunday, November11th Round RobinforTeamand Lincoln Dou91as Debate Thursday, November 8th.Bu.lneVoice: (352) 376-4446 Fax: (352) 376-4556ComptrollerDeliaKradolferdkradolferOalligator.orgBookkeeperJeffBloodsworthAccountingClerksPaulaRichardsStudentAccountingClerks:ReneeMacKerron,SandraJoa,..,JustinFitzdamAdmlnl.tratlonVoice: (352) 376-4446 Fax: (352) 376-4556GeneralManagerC.E.BarbercebarberOalligator.orgAssistantGeneralManagerPatriciaCareytcarey 0 alligator.orgAdministrativeManagerStaceyLedvinasledvina 0 alligator.orgAdministrativeAssistant,LenoraMcGowanImcgowan@alligator.orgAdministrativeClerkAliCahillProductionProductionManager Monette A.Helgesonmmhelgeson@alligator.orgAssistantProductionManagerWendyGoldsmithAmy Vance Eddie Rosenstock Margaret Fleigel Sales Representatives Laura Lovejoy Barbara Cole Keia Mastrianni Rachel Kim Peter Harter Billy Custer InternCoordinatorBarbaraColeSalesDevelopmentCoordinator..MeeganOwen,JenniferHandlineCirculationOperationsManagerScottMcKearnansmckearnan 0 alligator.orgOperationsAssistantsJasonDuganAdvertisingProductionSupervisorsDamarisClaude............................................ChristaLuckhurst............................................CarleyThompsonEditorialProductionSupervisorAmyHyltonAssistantEditorialProductionSupervisorKatieHaberman &)[DIDOOIDwaWl0000000amQ)(JID TheAlligatorofficesarelocatedat1105 W.UniversityAve.Classifiedadvertisingcan beplacedatthatlocationfrom 8 a.m. to 4 p.m.MondaythroughFriday.exceptforholidays.Classifiedsalso canbeplacedat tha UFBookstoresatthe Hub. 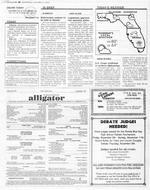 C Copyright2001.Allrightsreserved.Noportion.oftheAlligatormay bereproducedinanymeanswithoutthewrittenconsentofanofficerofCampusCommunicatronstnc.The Independent Rorida Alligatorisa studentnewspaperservingtheUniversity01Florida, publishedbya nonprofit501(c)(3)educationalorganization, atax-exempt,Floridaeducationalinstitution.CampusCommunicationsInc.,P.O.Box14257, Gainesville, FL32604.The A/ligatorispublishedMondaythroughFridaymornings.exceptduringholidaysandexamperiods.DuringUFsummeracademicterms The A/ligatorispublishedTuesdayandThursday mornings.The AlligatorisamemberoftheNewspaperAssociation01America,NationalNewspaperAssociation, FloridaPressAssociation and SouthernUniversityNewspapers.SUBSCRIPTION RATESOneSemester(FallorSpring)$15TwoSemesters(Fall and Spring) $29SummerSemester' $8 FullYear(AllSemesters)$35PleaseemailLauraMurray at Lmurray@ufl.eduifinterestedorcall the Florida BlueKeyoffice at337-0022with yourname,event you would like to judge andphone number.